Edward had enough! This was it! During the yearly sorcerer meet in a hidden cellar in Léon, Edward discovered a red stain on his precious robe. First he thought that it was just blood - but no, it was red wine! If another sorcerer would've noticed the stain he'ld have been the laughing stock of the whole meet! He didn't even drink wine! No, it was Bob's fault. What did he think? Just because he's a measly house-servant he's allowed to do any mistakes?! He had to pay - but Edward only had a few hours before his own Master would return. After tricking the mute Bob down into the cellar, Edward trapped Bob's mind with a maze spell. This spell would throw Bob into a featureless labyrinth and force him to attempt and escape. And the best part? While inside the maze, every minute in the real world would feel like an eternity! But as Edward was just about to start his evil laugh, Bob woke up. He escaped the maze! Edward went back into his room upstairs to draw a new one. It was perfect. A piece of beauty. This time, Bob would pay for not properly dedusting the wall behind his bookshelf! After trapping Bob in another maze, he confidently left the cellar - just to come back 10 minutes later with Bob already gone! Impossible! And he only had enough astral power left for one more maze spell! Edward had to figure out what strategy Bob used to escape his mazes, to create one that was inescapable. When mazed, a person has to decide for one simple rule/strategy on how to deal with every crossing paths. The rule shouldn't be more complex than one if/else statement and be easy to memorize! Only actual crossings are relevant, corners and underbridges are unimportant. The victim can only turn left or right. Going straight ahead in an "X-crossing" is not an option! If the victim runs into a dead end (Entrance) it simply turns around and walks back. Otherwise, the victim is never allowed to walk back. The victim has no sense of orientation, does not know how long the tunnels are or how many corners they had and cannot leave behind any marks. Everyting is featureless and looks exactly the same! "Alternate between left and right. Start with left." "If the [number of crossings passed > 15] turn left, otherwise turn right." "If the [(number of crossings passed + 1) % 3 == 0] turn left, otherwise right." How to handle "Underbridges" and "T-Sections"
There is no "going straight ahead". It's always "left" or "right"! 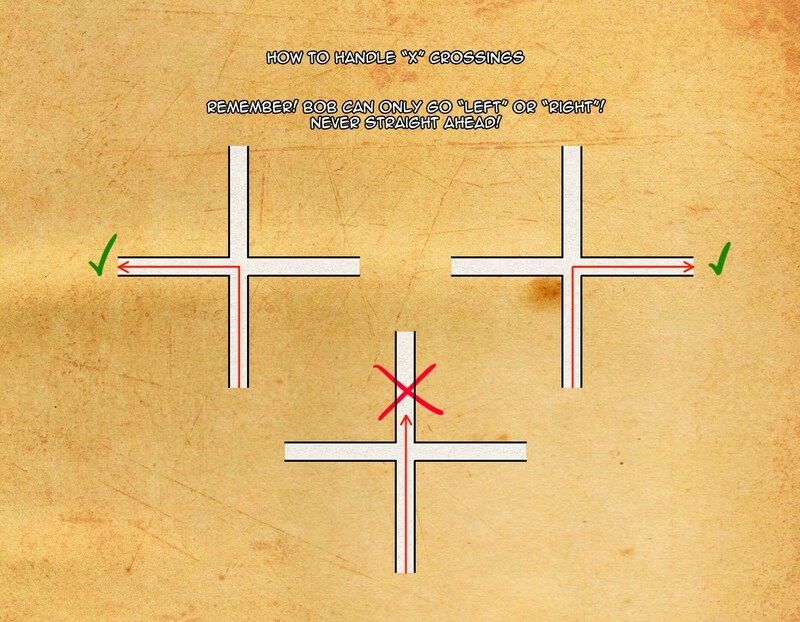 How to handle "X-crossings". Always go either "left" or "right", never "straight ahead"! Luckily, Edward is able to analyze Bob's path through another spell. The red line marks the way Bob took but doesn't display how many times he passed through the same tunnel, so the information is of limited use. While analyzing the second labyrinth, Edward was able to analyze how many times Bob went through a certain crossing (depicted by the number). 1. What simple rule/strategy is Bob using to get through Edwards labyrinths? 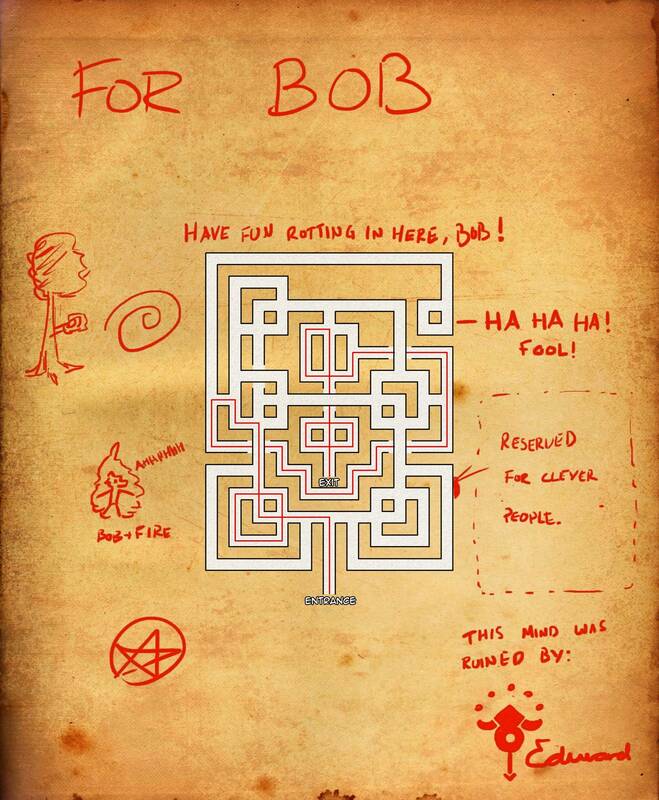 Bob uses the same strategy for every maze! 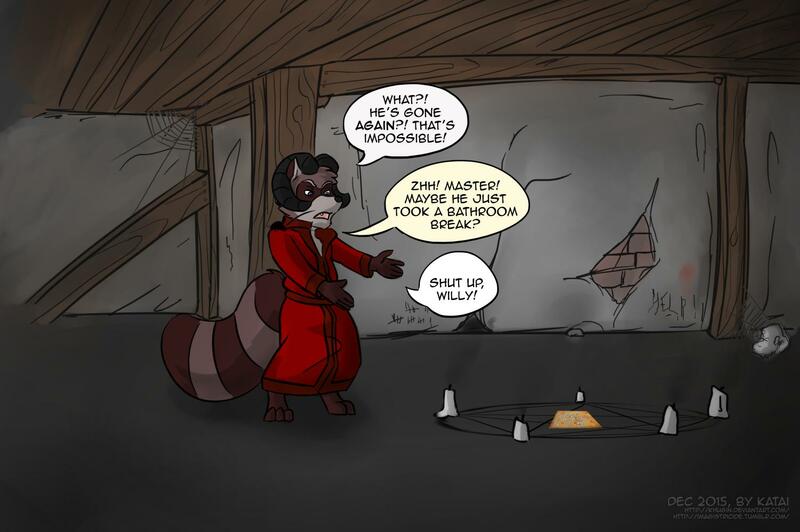 It does not change between mazes! 2. Is it possible for Edward to create a 2 dimensional, finite labyrinth to stop Bob from escaping a third time? 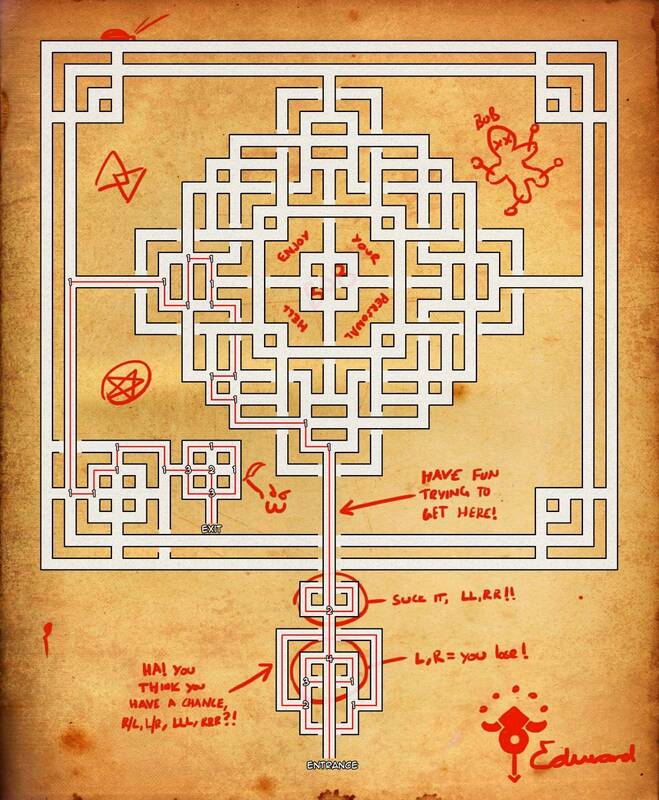 Guess it must be very troublesome to fit all those mazes and turns using the simple rule. Good job! 1. What simple rule/strategy is Bob using to get through Edwards labyrinths? Let's see how that works in each maze. But to adhere to the "simple rule", only the third one is valid. By maze 1, we need to start with LR. If the next one is L on maze 2, the next would need to be RL, resulting in LRLRL. 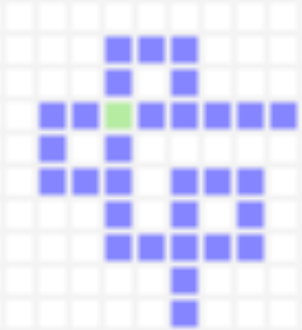 Then we need to complete the middle loop in clockwise manner (counter-clockwise will need to repeat the 1 junction on the right), resulting in LRLRLLLRL, which doesn't work in Maze 1. So the first three moves are LRR. 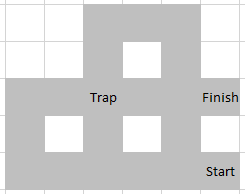 Using maze 1, the next two moves are LR. Using similar reasoning in maze 2 as in previous case, the next two moves are again LR (so far LRRLRLR), which from maze 1 we get the next moves as LLLRL. Then from maze 2, we have the next moves as: RLLLRLRLLLRLLLLLRL. And then we can complete the maze using the pattern we found thus far. The entrance is below, the exit is on the right. Starting from the third turn (the first two are LR), Bob either takes RL or LL (since the even-numbered moves will always be L). Edward did the evil laugh, until he realized that to enter this trap, Bob needs to take a right turn on one even move, so that Bob will be on his odd-numbered turn when he reach the green tile. Edward was utterly disappointed ("But primes are odd!" Edward yelled in frustration) and was about to give up when, fortunately, Willy reminded him that on the second move, Bob does a right turn ("Sometimes you can be useful, Willy," Edward said). "If the [number of crossings passed == 1 OR number of crossings passed == 3 OR ... OR number of crossings passed == 125] turn left, otherwise turn right." Not the answer you're looking for? Browse other questions tagged logical-deduction pattern story mazes or ask your own question.